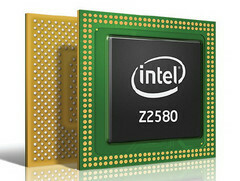 Intel presents three new Atom processors (Z2580, Z2560, and Z2520) for tablets and performance smartphones at MWC 2013. 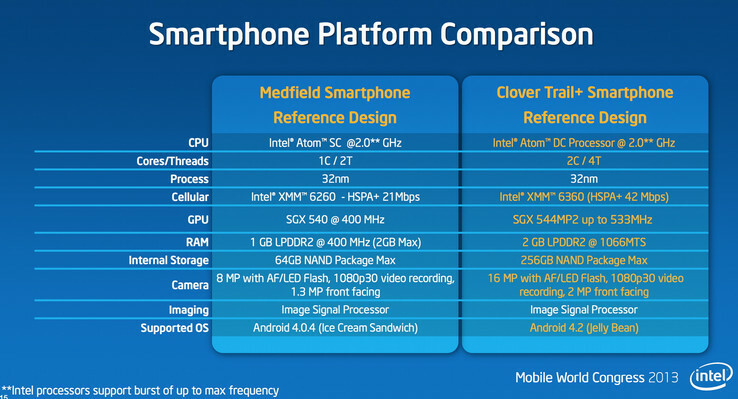 In comparison to previous-generation Medfield, Intel claims the new SoC designs to have 2x the compute performance, 3x the graphics performance, and Android-optimized power management. Intel presents three new Atom processors destined to power this year’s new tablets and high end smartphones, designed to run on Android. 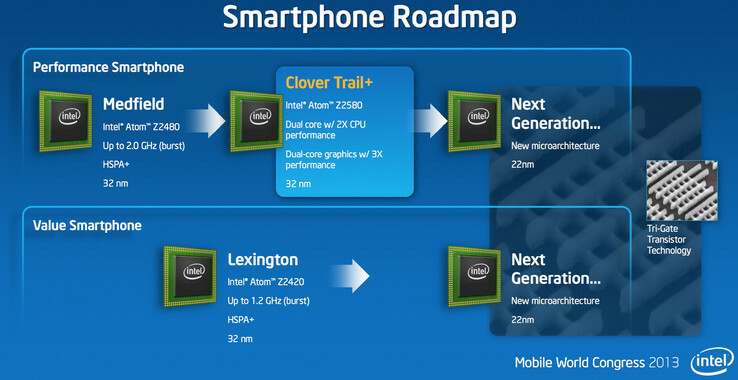 The company calls the new platform Clover Trail+ and features dual-core CPUs and dual-core GPUs. The results are twice the processor power and three times the graphics power compared to previous generation Medfield. 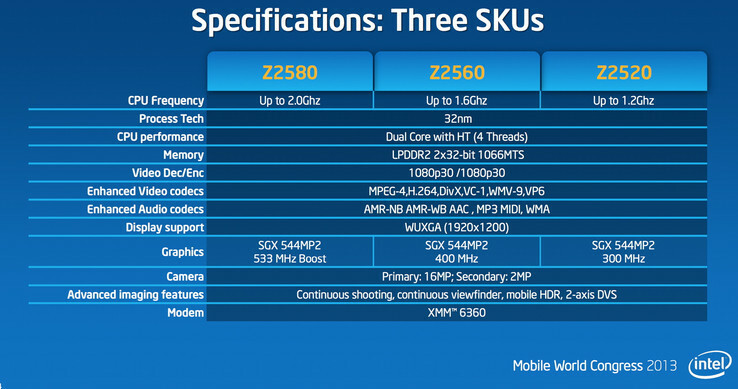 The platform’s 32nm dual-core Atoms are called Z2580, Z2560, Z2520 and their speeds are 2.0 GHz, 1.6 GHz and 1.2GHz respectively. They also feature Intel’s Hyper-Threading Technology, so with two threads per core they end up with a total of four threads. The SoCs all include the SGX 544MP2 GPU,providing clock speeds of up to 533 MHz. Though the previous generation Z2460 memory specs were 2 x 32-bit LPDDR2-800, Clover Trail+ goes up to 1066 MT/s with a max data throughput of 8.5 GB/s. The new SoCs include hardware acceleration for audio and voice, support HDMI, and also support WUXGA 1920x1200 for tablet screens. 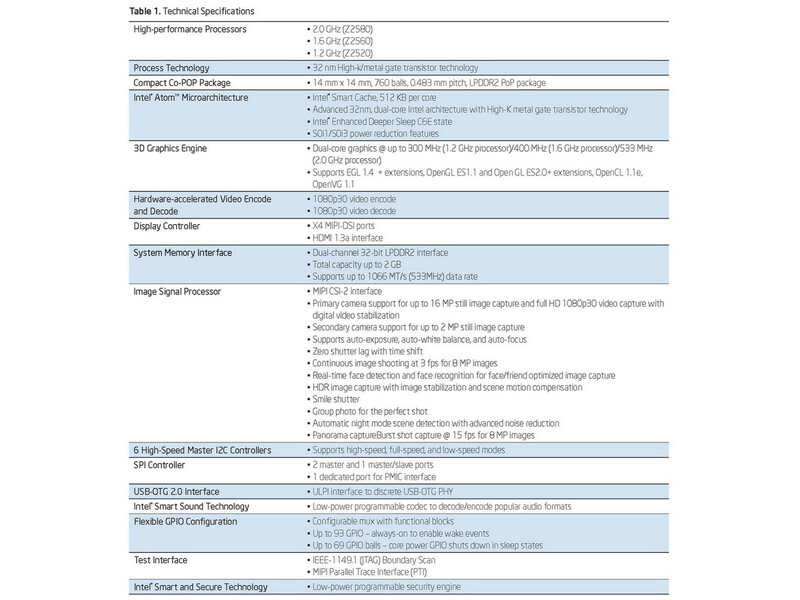 According to Intel there's also new firmware, drivers, middleware, and security software specifically optimized for Android. The platform’s imaging capabilities support 2 cameras (up to16 megapixel primary), as well as panorama capture. Other features include a 15fps burst mode for 8 megapixel images, real-time facial detection, and HDR image capture with de-ghosting for pictures taken on the move. 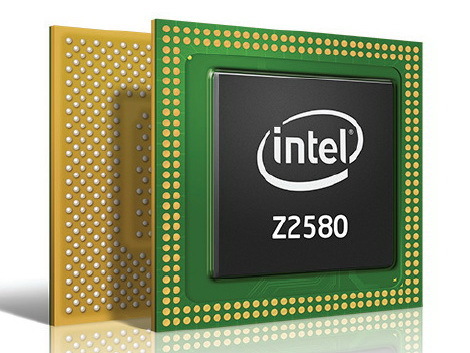 Intel also made a few other brief announcements: The Intel XMM 7160 4G LTE global modem, the Intel Atom Platform Z2420 for emerging markets, and finally the upcoming (holiday season 2013) Bay Trail quad-core Atom SoC.